Well, this year, we had to revamp the signs anyway because the food and beverage policy changed. We also realized that pre-work-life students had been consistently confused by “Water Cooler Quiet,” and CSI isn’t quiet as popular as it was a few years ago. So we revamped the top two levels. “Blue Monday” or rather “Goodbye Blue Monday” is a coffee shop and popular hangout in town. The noise level is generally fairly high, but there’s almost always work going on. Students go there if they want to work on projects together or do homework while socializing at the same time. 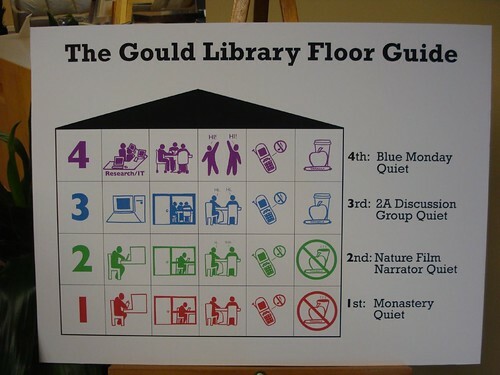 In other words, precisely what we want to recreate on the main floor of the library. One floor down, we want to encourage group work and talk, but with more restraint than on 4th. Group work happens, but not as much socializing. This was by far the hardest floor to name. What conveys work being done, talk, but restraint? We decided on “2a Discussion Group Quiet.” On our campus, 2a refers to the second class time-slot on Mondays, Wednesdays and Fridays. Imagine being the professor leading discussion before 10am… yes, now you see why we chose that time-slot. Discussion happens, but not boisterously. Students told us not to mess with Nature Film Narrator Quiet or Monastery Quiet, so we didn’t. Down on first, if you type too loudly somebody might just pass you a note (rather than whisper) saying that you should respect the needs of your fellow sleep-, light-, and food-deprived students as they labor through their comps research. What a great way to let users know what to expect in different areas! I love it! I would say “thanks!”… but it wasn’t my idea. :) I sure work with a bang-up crowd of librarians, though. Rather late, but I wanted you to know this is just brilliant.